Taking an infrared thermograph of an air conditioned building in the daytime, can be quite alarming. Infrared thermography is the same technology in night vision goggles used by military special forces. It reveals the infrared light spectrum or “heat signature” of objects. On buildings, it reveals variations in heat flow. The more heat flow the brighter the image. Windows and skylights, being the least insulated are usually the biggest culprits of energy waste. For the last 100+ years, heating and air conditioning systems have compensated or covered up the wasted energy flowing through windows and skylights. But with high energy costs and power plant pollution, that veil is starting to be removed. Let visible light through, so “free” natural light can come in and people can see outside. Insulate the building, i.e. block heat flow in or out. Block UV rays to protect your carpet, furnishings and skin. Minimize glare from direct sunlight. So, again, why are windows not more efficient? New buildings are usually designed to meet minimum code requirements to keeps costs down. So, “expensive” products like triple pane, low-emissivity, gas filled windows are rarely considered. And until construction techniques change dramatically, window replacement will remain costly due to the time and labor required to replace them. As a result, the energy savings payback for window replacements is usually way too long compared to other options or priorities. Fortunately, repairs and upgrades of existing windows is very cost effective. Air infiltration and to a lesser extent noise infiltration can be reduced with simple caulking and weatherstripping repairs. But, if your window frame is in poor shape or your building is next to a noisy airport or street, heavy shutters, blinds, double or triple pane windows may be your only option. When it comes to the main part of the fenestration, the glass or plastic (in the case of skylights), recent material breakthroughs in nanotechnology are revealing some very promising results to reduce solar heat gains. Before explaining, it’s helpful to understand some physics. The first law of thermodynamics states, “energy is neither created nor destroyed, it simply changes form”, e.g. heat, light, sound. In simple terms, the sun is a hot ball that radiates energy (in the form of light) to the earth which then heats up the earth. After being filtered through the atmosphere, sunlight reaches the earth’s surface as ultraviolet light, visible light and infrared light. See image below. Ultraviolet (UV) light is invisible but we see the damaging effects in faded carpets and furnishings or worse – skin cancer. Visible light (daylight) is the rainbow of colors we see with our eyes. Infrared light is the intense heat we feel when directly exposed to the sun, e.g. when we come out of the shade or a cloud suddenly moves away. When it comes to windows, the goal is to block all the UV light, let most or all of the visible light through and block or selectively control the infrared light. Here’s why. When the sun’s light hits a window, some is reflected off and some is absorbed by the glass (which can then be directed into, or away from, the interior space) and some passes directly through. For plastic windows and skylights, much of the UV is blocked, little is absorbed by the material, but most of the infrared light passes right through into the space as heat. Conduction is heat transferred between two objects when they touch – such as when you touch a hot skillet or a warm window. Convection is the flow of a fluid like warm or hot air rising as it is heated up, e.g. when you lean down and open the door of a hot oven and feel the rush of hot air hit your face or sit next to a hot window and feel the heat. Likewise, a large window or door can feel “drafty” as air rises up even though it’s not “leaking from outside. So, take this into consideration if this is causing you to consider replacement windows. Radiation is light energy heating up an object. For example, when you step into the sunlight you can feel the sun’s radiant energy on your skin as your skin cells absorb the sun’s radiance. For cooler climates (i.e. far northern or far southern hemisphere), it is ideal to allow the infrared heat in during the winter, but block as much as possible the rest of the year to reduce cooling loads. For warmer climates, where most buildings are located, cooling costs usually dominate, so reducing solar heat gain usually dominates decision making. But, maximizing natural light (without glare) is almost always desired. So, how do we better manage or reduce solar heat gain? Overhangs, awnings, light shelves and best of all, deciduous shade trees can help let in the winter sun and block the summer sun. Unfortunately, they aren’t always practical and were not considered in the vast majority of buildings in existence today. Clerestories are usually better than traditional skylights, but they are significantly more expensive and rarely used as well. Then, there are interior window treatments and window coatings. Interior treatments like shade screens and blinds can help stop the heat, but isn’t the whole purpose of a window to be able to see through it or let the natural light in? That leaves coatings and tints. If your goal is to block out the visible light, then any dark tint will do. If your goal is to block out the light and the heat, then a broad spectrum dark tint will help. But even that is limited. Dark curtains, shades or even plywood will actually work better. However, If your goal is to block out just the UV light and the most or all of the infrared heat while letting the VISIBLE light come through, then new nano technologies, are your best bet. Traditional glue-on window films. Eastman V-Kool 70, Enerlogic 70 and Hi-Lite 70 are high quality plastic films that preform very well. They each block 99% of UV rays and up to 94% of infrared heat while only allowing about 60% of visible light in. Unfortunately, blocking 30-40% of light still means the interior lights will need to be turned on to compensate. The materials are relatively expensive and worse yet, they all tend to crack, chip or peel over time. If applied poorly they will bubble. Liquid window insulation is a spectrally selective paint-on, high performance nanotechnology coating. 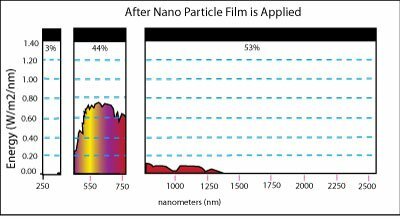 Nano coatings are a breakthrough because the particles are so small they are invisible to the human eye while adding the desired properties to the coating. With the small size, the molecules won’t change the optics of the visible light, but are arranged to selectively block out other desired wavelengths. Due to its application method, it is virtually impossible for liquid nano-tech coatings to bubble, chip, crack or peel. 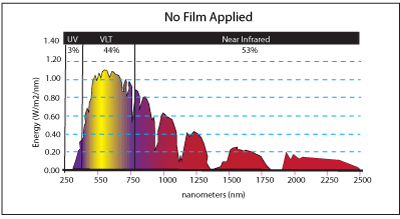 Available “tints” are 4%, 10% and 16% opacities. The 4% version is virtually invisible and so clear that it can legally be used on automotive windshields*. The 16% version has better thermal properties and a slight visible tint to help reduce glare. The new 10% opacity is a popular “blend of the two which helps cut glare a bit, although not as much as traditional plastic window films. Like the expensive films above, liquid window insulation can block 99% of UV radiation. But unlike the (now) old tech, liquid window insulation allows 84% – 96% of visible light in while blocking 85% – 97% of infrared heat. The more opaque, the more infrared heat is blocked. Liquid window insulation has outstanding performance for most applications. Perhaps the most important metric for window films in modern “green” building design is the light to solar heat gain ratio (LSG), the LSG ratio provides a gauge of the relative efficiency of different glazing systems in transmitting daylight while blocking solar heat gains. The higher the ratio, the brighter the room is without adding excessive amounts of heat. The following chart is a compilation of (lab and NFRC) spectrometer test data. For a spectrally selective solar control film or coating, the LSG ratio will typically be higher than 1.2, while for other films, the LSG ratio will be smaller than 1.0. The LSG ratio for liquid window insulation is superior to other high end films. Tint. The opacity or percentage of natural (visible) daylight being blocked. The lower the percentage the better, unless your goal is to darken the space. Keep in mind, dark plastic films tend to be reflective at night, blocking the view out at night. 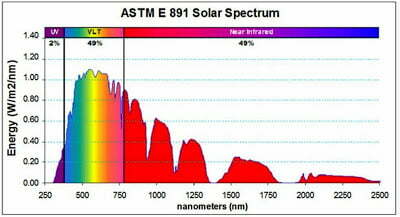 Visible light Transmission is directly related to tint. The higher the percentage the better. UV rejection is the % of damaging UltraViolet rays being blocked. The higher the percentage the better. 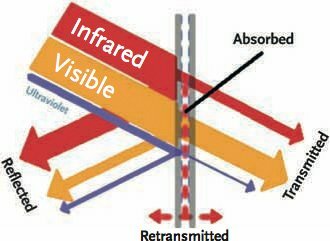 IR rejection is the % of infrared heat from the sun being blocked. For warmer climates that need cooling, the higher the percentage better. SHGC is the % of solar heat entering the space. For warmer climates that need cooling, the lower the percentage better. LSG is the ratio of Visible Light Transmission over Solar Heat Gain (VT/SHGC) which measure overall efficiency of a window or skylight coating. The higher the percentage the better. The Solar Heat Gain Coefficient (solar efficiency) of new (dual pane low-e) assemblies ranges from 0.41 – 0.60. However, with daily thermal and UV aging, the soft rubber seals harden and decay, allowing the inert gas between the panes to leak out over time. As a result, the thermal efficiency is dramatically reduced, leaving the SHGC higher (less efficient) than the even the single pane NanoTint coated alternative. To take this analysis a step further, we made up our own field test boxes with the front face all glass and faced them directly into the sun. 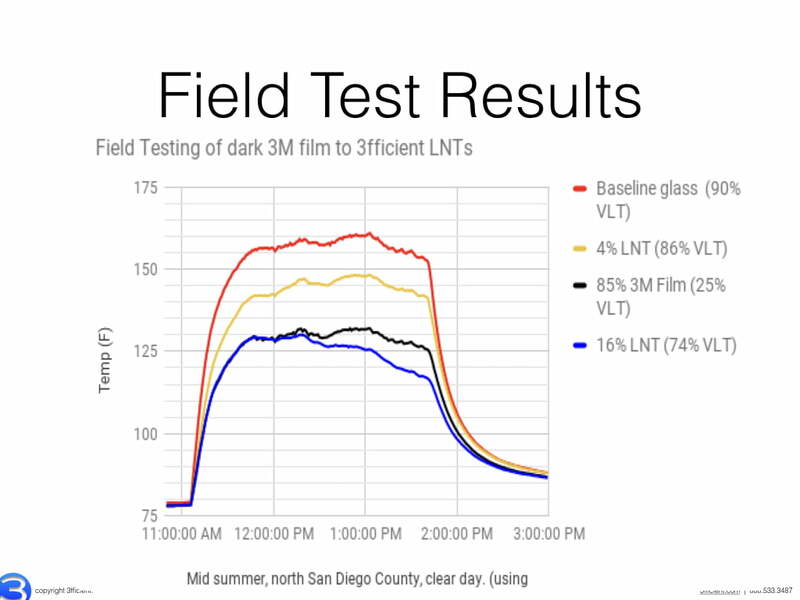 The results below show the mostly transparent (16%) coating matching dark “limo” tint with solar incidence at 90 degrees, but as time passed and the sun angle became less direct, the nano coating far outperformed even the darkest of traditional tints. Since the sun is rarely at a right angle to any glass surface, one would expect the liquid window insulation to lead the pack in cumulative energy savings and comfort, such as in a vehicle or next to a window. I think one of the most compelling applications for liquid window insulation is on skylights. Skylights are great at bringing in natural light deep inside a building, but the side effect is a lot of unwanted solar heat gain. Most are plastic, curved and very difficult to apply plastic films to. This is where liquid window insulation really shines (pun intended). Getting traditional film on an overhead skylight is very challenging. If it’s curved plastic, it’s almost impossible. Liquid window insulation, on the other hand, just rolls on with a special paint roller. For opaque skylights, it can even be sprayed on. UV rays will be blocked out and direct infrared heat dramatically reduced. With better durability, longevity and costs at or below cheaper dark films, the liquid window insulation is a far superior value in comfort, durability, aesthetics, thermal performance, first cost and lifecycle cost. In terms of window “upgrades” any of the above films are good, but the liquid window insulation seems to be a consistently better in all areas. For a more information on installation, click here. *Note. Always confirm with local vehicle code and/or enforcement authorities to ensure code compliance.